Microsoft PowerPoint is probably the best tool currently available for creating professional business presentations. The software is designed to create visually impressive presentations that include bullet points, charters and even video clips and audio files. However, the file format of PowerPoint presentations is not perfectly suited for all types of situations, especially when you can't be in the room where the presentation should take place. Screen capturing software like Camtasia 9 offers a solution to this problem because it lets you record your PowerPoint presentations. In case you were wondering how you can record a PowerPoint presentation, here is a detailed guide that will provide you with all the essential information you'll need to capture your first PowerPoint presentation. If you have already installed Camtasia 9 to your computer that means that the version of PowerPoint you have on your PC is now equipped with the Camtasia Recording Toolbar. In order to access the toolbar, start the PowerPoint and click on the Add-ins tab located in the software's ribbon. Camtasia Recording Toolbar should be located there, but if you cannot see it, that means that the toolbar is probably disabled. 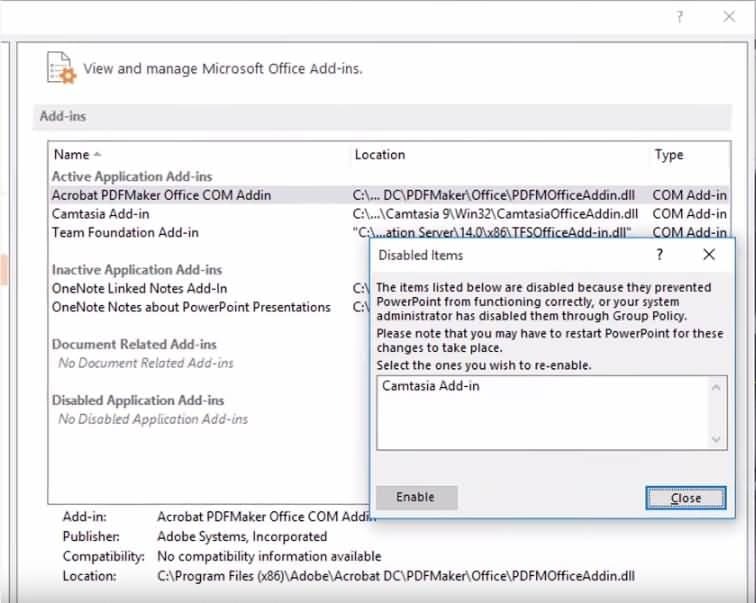 In order to enable it, go to File, then select Options or PowerPoint options depending on the version of PowerPoint you are using and select the Add-Ins tab. Located at the bottom of the page there is Manage feature, select the Disabled Items option from the drop down menu and click Go. This action will allow you to see all disabled items in PowerPoint, select the Camtasia Add-in by clicking on it and then click Enable. 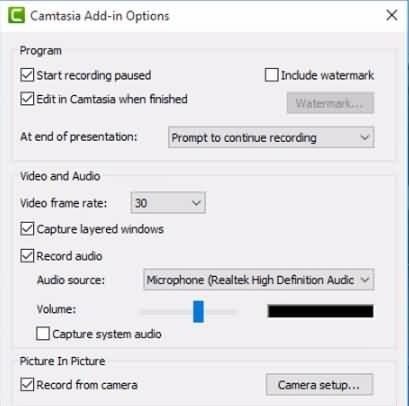 If you performed all of the steps above correctly, you should now be able to see Camtasia Recording Toolbar in the PowerPoint's Add-Ins tab. Before commencing the PowerPoint presentation recording session, click on the Recording Options icon located at the very end of the Camtasia Recording Toolbar. You can set the preferred frame rate of the video to 30fps, adjust audio setting such as Audio Source, Volume and decide whether or not you want to record system audio. For further customization, click the Recording Options button. By clicking on the Record from camera box, under Picture In Picture option, you will be able to access the camera setup. From there you can adjust Output Size by clicking on the Video Format feature and you can also set brightness, contrast, sharpness, hue and white balance values by clicking on the Camera Options button located above the video format feature. Before closing the Recording Options window, make sure that Edit in Camtasia box is marked and you are ready to start your recording session. Click on the record button to start your recording session. When you want to stop recording, press ESC button on your keyboard, and after your session is over, Camtasia will offer you to render the video or edit it in the software's video editor. Publishing the recording of your PowerPoint presentation on YouTube requires you to pay close attention to the aspect ratio of your slides because online video sharing platforms like YouTube are designed to play wide screen videos with a 16:9 aspect ratio. The first step you need to make takes place before you start creating your presentation. Go to the Design Tab and select the Page Setup option, then click on Slide Size drop down menu and select On-Screen Show 16:9 option. After you adjusted the aspect ratio of your slide you need to select the resolution in which your presentation will be displayed. In order to do this, go to Slide Show tab and select 1280X720p option from the Resolution drop down menu. Before starting the recording session head over to the Add-ins tab and adjust video and audio settings in the Camtasia Recording Toolbar as described in the previous section of this article. After your recording session is over open the video in Camtasia's video editor and place the video clip on the timeline. Once you've placed the video clip on the timeline the Camtasia video editor will offer you to select editing dimensions for your new project. 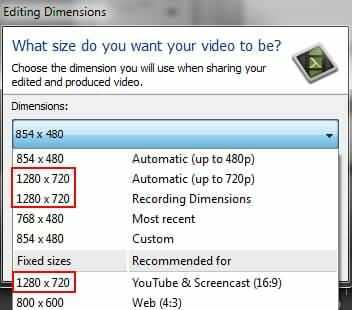 Select the 1280X720p option that is recommended for YouTube and Screencast. Now that you've selected the editing dimensions that fit the aspect ratio of your PowerPoint presentation you can proceed with the editing process. After finished editing the clip, simply click on the Share button and select YouTube from the drop down menu. Once the video is uploaded, you'll notice that it fits the video player perfectly and that the quality of the video is also very good. You can select the playback quality you want by clicking on the Settings button located at the lower right corner of the video player and choosing 720p or any other video quality the quality option offers. Users who have the 2013 and 2016 versions of Microsoft's PowerPoint can record their presentation directly from the software, although the 2013 version requires an update released in February 2015. In order to start a screen recording session, go to the Insert tab on the software's ribbon and click on Screen Recording option. The control dock with Record, Stop, Select Area, Audio and Record Pointer options will emerge. The last two options are selected by default and if you'd like to turn them off, you must deselect them before starting to record. Use Select Area feature to highlight the part of the screen you want to record and commence the recording session by clicking the record button. After you finished recording save the file you created by right-clicking on the slide that depicts the recording and selecting the Save Media As option. Alternatively, you can use the Filmora scrn Screen Recorder Software to capture your PowerPoint presentations. Filmora offers a wide range of recording and editing options that will enable you to create high-quality videos that will captivate the attention of your viewers. This cost efficient editing software is a perfect choice for users who need a software that can help them create professional and engaging videos.